Been repairing quite a bit of discarded equipment recently – it’s yielded some good finds. Pulled a broken Leica GZ6 outta the trash- with cracked plastic gears (apparently like every other GZ6). It was super easy to disassemble and remove the gears – which I tried to super glue back together and use. 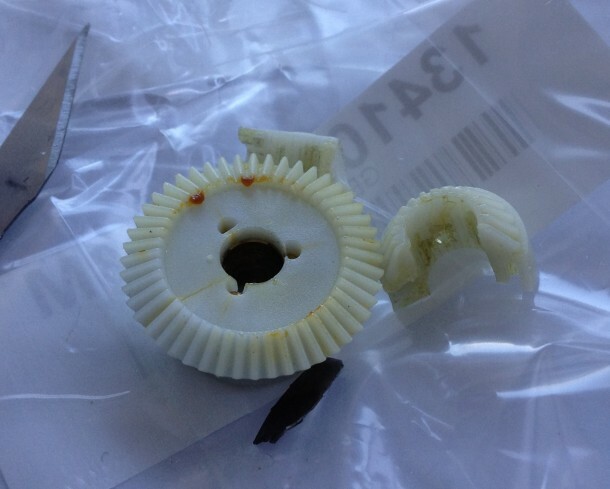 The glue didn’t hold and after trying to find replacement gears at SDP/SI. I started googling for replacement microscope parts. After quite a bit of searching (which I why I’m posting this) I found them at Reichert. All told, around $40 for a sweet stereo zoom microscope. It had eyepieces and part of a stand. I gotta build a stand and an illuminator, then I’m set. Thanks for the info — I have 2 GZ6 sitting in my office with busted gears. My story is exactly the same (right down to the super glue). Thanks for the excellent info. I purchased the new gz6 gears…and now that I am reassembling the unit my memory of how it goes back together is failing me…I cannot find any diagrams of the zoom assembly anywhere…can you provide any assistance…there are two small clamps…one black one brass…and a small spring washer that are in question. but the same does not come off. You know if you have to do something else before? Where can I buy the part ? There are two gears: the spindle gear that is vertical which move the lenses, and drive gear that turn by knobs and engage with the spindle gear. The spindle gear broken into three pieces. The drive gear also cracked. The gears look like made from nylon so the adhesive is not going to work. The way spindle gear is seated tight on spindle also, cannot do much with proxy. The spindle is sit at balls on both end therefore modify it to drive from top of scope (turn the spindle directly from top) also out of question. The shop want $175 for a set of metal gear, too expansive (understandable as for low the demand). The way the teeth on gears is designed also hard to make exact. I dimensioned but don’t think has all the details to make them work. So, I go for a mechanical solution: First, I drill holes on the spindle gear and weaved a steel wire to tie it back. I am lucky that all the pieces are found and no damage of teeth. Second, add a steel wire as tension ring to secure cracked drive gear. The challenge is to put spindle gear back. The drive gear remove/install is relatively easy. But to install spindle gear require remove the lens drive mechanism. It is calibrated assembly so care must be taken. I manage to figure out how it is attached and got it back in. Now, the zoom is working with little bumps when go cross the crack. I am sure this will not last long but am happy to get function back for the time being.